UNISON provides the broadest range of legal help to union members in the UK. We offer advice and assistance not just with work issues, but for you and your family outside the workplace too. A guide to our legal services is available from the Legal Form Library. We work jointly with Thompsons Solicitors who are the most experienced personal injury practice in the UK with over 1000 staff in a network of offices nationwide. Highly respected in the fields of personal injury, industrial diseases and medical negligence, Thompsons are ranked in the Chambers Guide to the Legal Profession and in the Legal 500 as a leading firm dealing with accident compensation. Thompsons will only work for injured people and unlike most other solicitors, will never work for defendants or employers. Thompsons Solicitors are not only proud to help members of the Ymlaen-Forward UNISON Branch with assault and personal injury compensation claims but also with matters relating to employment rights such as pensions, dismissals, discriminations, equal pay and transfer of undertaking (TUPE). These services can be accessed via the Branch Office. Thompsons are unable to help non-UNISON members with employment rights cases so if you are not a UNISON member, please contact the Branch Office on 029 20228933 to join us today. Have you had an injury or accident at work recently? We know that assaults and injury at work in the voluntary sector in Wales are a very common occurrence. We have even heard that some employers tell you that it is part of the job, or not to complain if you are assaulted lest there might be a problem with corporate reputation or future tenders; that those who complain are part of the compensation culture or that if you see a solicitor you would have to sue a service user. Of course all of this is absolutely, 100%, not true. An accident or an assault can be shocking. The physical pain and emotional trauma can be hard to bear. But it’s the costs of an accident that can be long lasting too. Lost wages, lost promotion, travel to and from medical treatments, special care needs and more, can all put a strain on your financial resources. Which is why UNISON and Thompsons Solicitors are here to get you compensation for everything your accident has cost you. This service is completely FREE as part of your UNISON membership and you keep 100% of the compensation. UNISON has won more than £350 million in compensation for members involved in work-related personal injuries. This includes assaults, industrial diseases and accidents at work, on the way to or from work or on union business. With Thompsons Solicitors we are also campaigning to reduce accidents and assaults at work in Wales. If you have had an accident or been assaulted at work, the form PI is available from the Legal Form Library. Download it, fill it in and post it back to the branch office today. If you’ve had an accident on the job or outside work during the last three years you may be entitled to compensation. Your family may also qualify for injuries outside work. In case of accident or injury you can phone the Branch Office on 029 2022 8933 or download the special form from the Legal Form Library, fill it in and post back to the branch office today. One of the very best services UNISON provides to its members is free legal representation if you face criminal charges arising out of your work. Criminal charges only happen to other people right? Wrong. Criminal charges are only brought against guilty people right? Wrong. I couldn’t possibly get arrested from working could I? Yes. It’s 2am in the morning. You have finished your shift supporting a vulnerable person. You are at home. Looking forward to tomorrow and wondering what the day will bring. And the phone rings. The phone never rings this late. Who could it be? Has someone died? You pick up the phone. It is the Police. No-one has died. The person you care for has said you might not have been as gentle as you know you are. Your employer had to let the Police know. The Police will be around in an hour. To have a little chat. Nothing to worry about. It will be about an hour. You are on your own. Your mind is racing. Your heart is racing. You are terrified. What must the neighbours think? What do you do? Where do you go? As an Ymlaen-Forward UNISON member you should come to UNISON whatever the time of day or night. UNISON does not sleep when our members are charged with a criminal offence, when the police want to talk about a POVA matter, however trivial it might appear or however innocent you are. This also includes representation for members for road traffic offences only if your job is at risk following a conviction and excludes drink driving offences. To access this service you should download the special form from the Legal Form Library, fill it in and post back to the branch office today if you have time or alternatively contact the Branch Office on 029 2022 8933 or UNISONDirect on 0845 355 0845 yourself and thereafter complete the CR form with the branch to ensure assistance continues. In an emergency outside UNISONdirect hours you can call the criminal helpline on 0800 587 7530. 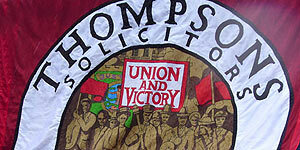 UNISON members can get free initial legal advice on any matter not related to work from Thompsons solicitors. This service entitles you to receive a 30-minute telephone interview. The service does not apply to advice on a legal action that you are already pursuing or cover Inheritance Tax issues. Members are not entitled to return for advice on the same issue under this scheme. Phone UNISONdirect on 0845 355 0845 for more details or download the special form from the Legal Form Library, fill it in and post back to the branch office today. You may be eligible for advice from UNISON’s solicitors if you need to live in particular accommodation as part of your job or your employer has given you accommodation as part of the job. Phone UNISONdirect on 0845 355 0845 for more details. Members can use our free wills service and are eligible for cut price conveyancing. Phone UNISONdirect on 0845 355 0845 for more details or download the special form from the Legal Form Library, fill it in and post back to the branch office today. UNISON can provide advice or represent members who experience immigration problems that threaten their employment. Phone UNISONdirect on 0845 355 0845 for more details. UNISON offers a free initial screening service for members who have been affected by medical negligence. Phone UNISONdirect on 0845 355 0845 for more details.